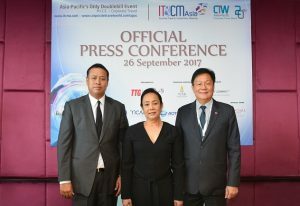 Thai Airways International Public Company Limited (THAI) together with Thailand Convention and Exhibition Bureau (TCEB) and the Incentive Travel and Conventions Meetings Asia and Corporate Travel World Conference (IT&CMA and CTW) held a press conference to officially announce the opening of the week-long convention at the Bangkok Convention Center at Central World.The tri-party joint press conference was held by Mrs. Pariya Chulkaratana (middle), THAI Vice President, e-Commerce and Ancillary Marketing Department who represented THAI along with Mr. Chiruit Isarangkun Na Ayuthaya (left), President of TCEB and Mr. Darren Ng (right), Managing Director of TTG Asia Media. IT&CMA and CTW is the world’s only double-billed event in MICE and corporate travel that offers delegates to do business, learn, and network and stands to be the only global event with the largest exhibition showcase of Asia-Pacific MICE suppliers. This year marks the 25th anniversary of IT&CMA and also 20th anniversary of the Corporate Travel World Asia Pacific.